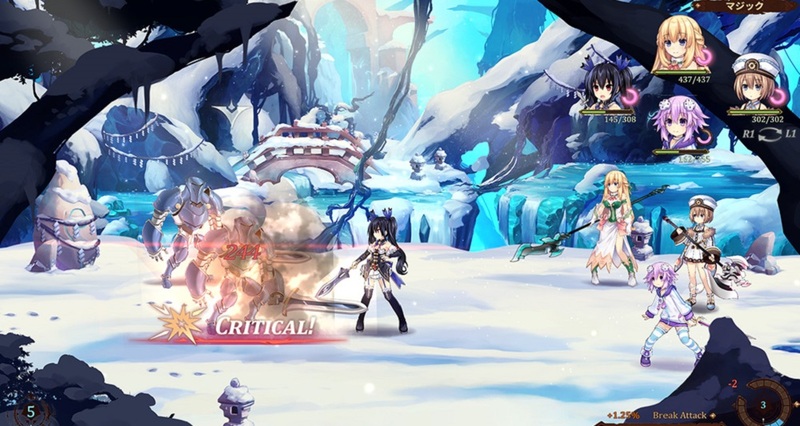 Compile Heart have freshly-updated the Japanese website to their Canadian-developed action RPG, Super Neptunia RPG, which will see the Hyperdimension Neptunia characters battle amnesia and an army of enemies during their latest jaunt through Gameindustri. Super Neptunia RPG will star the irrepressible Nep-Nep, as she and her party of pals make their way through 2D platform-based dungeons. Attacking enemies will switch the game to a turn-based battle system. Players will be able to use a variety of individual character skills, as well as rearrange attack formations in order to gain victory over their opposition. Melee, Magic, Stat and Support options will all come into play, as well as the Goddess Gauge which, when maxed out, allows party member sto transform into their Goddess form, ala previous Neptunia titles. The dungeons will be maze-like in nature, although previously inaccessible areas will open up as Nep learns new skills to allow her to traverse the environment. Honestly, it just sounds like your typical Hyperdimension Neptunia title, but just in a different aesthetic format. Perhaps what the series would have been if it had launched in the 16-bit era. Still, there's always room for Nep and friends, and this will also make a great Switch title on the go. You can check out some new screens in the gallery below. Super Neptunia RPG launches on PS4 and Nintendo Switch this Fall.